09/27/16 Hyundai motor america (hyundai) is recalling certain model year 2015 genesis sedans manufactured february 1, 2015, through may 20, 2015. the affected vehicles are equipped with a seven-inch tft-lcd instrument cluster that may display an incorrect vehicle speed or may illuminate all of the warning lights or not illuminate a warning light that needs to be lit. 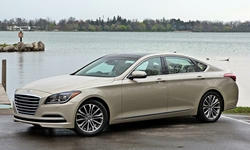 04/14/15 Hyundai motor america (hyundai) is recalling certain model year 2015 genesis vehicles manufactured february 21, 2014, to january 24, 2015. water may leak into the rear combination lamp assemblies and cause an incorrect gear display on the instrument panel or a delay in the engagement of the selected gear when the vehicle is shifted from park to reverse or drive. 08/04/17 Brakes and Traction Control Hyundai motor america (hyundai) is recalling certain 2015-2016 sonata and genesis vehicles. in the affected vehicles, the warning light to indicate that the parking brake is applied may intermittently not illuminate in the dash due to corrosion in the switch. 12/24/13 Brakes and Traction Control Hyundai is recalling certain model year 2009-2012 genesis vehicles manufactured april 30, 2008, through march 28, 2012. the vehicles may contain brake fluid which does not protect against corrosion of the hydraulic electronic control unit (hecu). 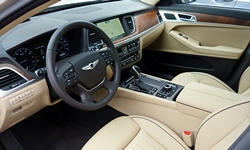 Hyundai will notify owners and instruct them to bring their vehicle to a dealer for service. hyundai will inspect the hecu module for proper operation, and will replace the modules as necessary. hyundai will replace the factory brake fluid in those vehicles that have not previously had the factory brake fluid replaced. these repairs will be done free of charge. the recall began on december 24, 2013. owners may contact hyundai at 1-800-633-5151 or by email at consumeraffairs@hmausa.com. hyundai's recall number is 114. 04/22/16 Electrical and Air Conditioning Hyundai motor america (hyundai) is recalling certain model year 2012 genesis vehicles manufactured august 1, 2011, to april 30, 2012, and 2011-2013 equus vehicles manufactured july 10, 2011, to june 12, 2012. the windshield wiper motor cover seal on the affected vehicles may degrade allowing corrosion on the wiper motor's circuit board. the corrosion can cause intermittent or total loss of wiper function. Inoperative wipers during inclement weather can decrease driver visibility, increasing the risk of a crash. Hyundai will notify owners, and dealers will replace the wiper motor cover and seal, free of charge. the recall began on april 22, 2016. owners may contact hyundai customer service at 1-800-633-5151. hyundai's number for this recall is 140. 04/14/15 Electrical and Air Conditioning Hyundai motor america (hyundai) is recalling certain model year 2015 genesis vehicles manufactured february 21, 2014, to january 24, 2015. water may leak into the rear combination lamp assemblies and cause an incorrect gear display on the instrument panel or a delay in the engagement of the selected gear when the vehicle is shifted from park to reverse or drive. 03/23/15 Electrical and Air Conditioning Hyundai motor america (hyundai) is recalling certain 2009-2011 hyundai genesis vehicles manufactured april 30, 2008, to november 21, 2010, and 2011 hyundai equus vehicles manufactured july 31, 2010, to november 21, 2010. due to a circuit failure, the stop lamps in the affected vehicles may not illuminate. A following vehicle may not recognize that the vehicle is slowing or coming to a stop if the stop lamps on the vehicle do not illuminate as expected. there is an increased risk of a rear-end crash as a result. Hyundai will notify owners, and dealers will repair the stop lamp switch circuit, free of charge. hyundai issued an interim notification to owners on january 6, 2015. the recall began on march 23, 2015. owners may contact hyundai customer service at 1-855-671-3059. hyundai's number for this recall is 125. 02/19/16 Other Hyundai motor america (hyundai) is recalling certain model year 2015 genesis vehicles manufactured march 3, 2014, to february 9, 2015, and equipped with hankook ventus s1 noble2 tires installed as original equipment. the affected tires may develop cracks in the tire sidewall, resulting in a loss of air.